Bath-based licensed giftware firm Half Moon Bay has appointed specialist licensing public relations agency Highlight, also based in the city, to manage its national PR. The move comes as Half Moon Bay seeks to build on its market-leading position for entertainment brands such as Harry Potter, Disney, Marvel and Star Wars. 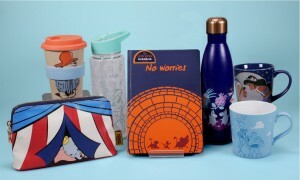 Last week it unveiled a much broader portfolio of product ranges featuring classic styles for the latest blockbuster entertainment franchises, set to launch around this year’s upcoming releases of Captain Marvel, Dumbo, The Avengers, Game of Thrones (Season 8), Aladdin, and Toy Story 4, plus the live-action remake of The Lion King. Half Moon Bay extended its range last year by acquiring Warminster homeware and fashion brand Shruti and launching its first imprint, Ice House Books with titles Moomin Comfort Food cookbook and The Thunderbirds Lady Penelope’s Boss Lady Handbook. Highlight will generate national press coverage across Half Moon Bay’s whole portfolio, from best-sellers such as the Harry Potter Marauder’s Map heat change mug to new bamboo lunch boxes, stationery, bags, keyrings and 3D mugs. New lifestyle ranges include homewares and accessories featuring RHS (Royal Horticultural Society) Irises and Hellebores, illustrations from May The Thoughts Be With You creator Charlotte Reed, plus designs from Planet Cat. Half Moon Bay managing director Peter Thompson said: “2019 is an exciting and busy year for Half Moon Bay, the acquisition of Shruti and launch of publishing imprint Ice House Books makes our partnership with Highlight even more crucial. Highlight’s clients range from family and lifestyle brands to food and drink companies, creative agencies and pioneering businesses. Its consumer division specialises in promoting children’s entertainment characters, books, TV shows, toys and games, plus parenting products and services.